Leaf Handcrafted Furniture's Lars Laug, and painting partner, Erin Nichols nominated Arts Project Australia, which exists to nurture and promote artists with an intellectual disability as they develop their art practice. 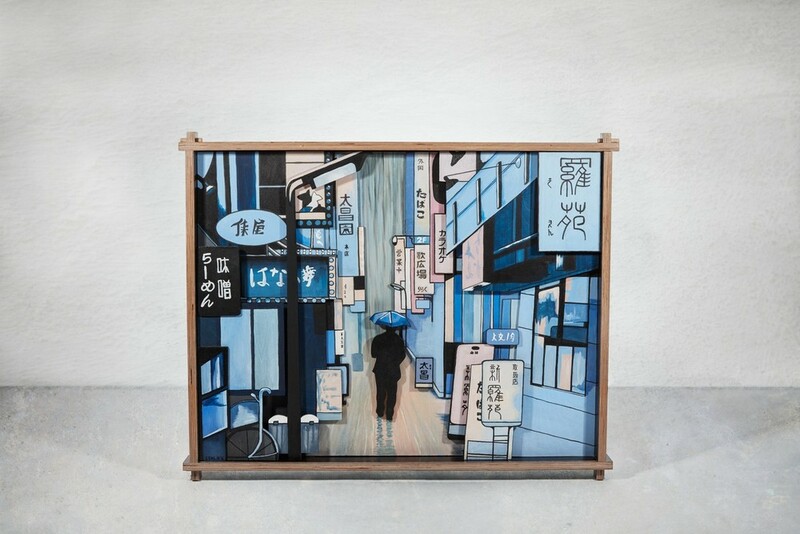 Erin’s original Rainy Day was part of a series of 4 illustrations, one for each of the seasons, involving a lone man in the centre of an urban scene in Japan. Rainy Day is her winter piece, the blues reflecting the rain and cold. Lars wanted to work with one of Erin’s urban scenes and felt Rainy Day was the best one to combine their talents and create a piece that would make the image more 3D. Each Shape was individually cut and layered over the top of the previous to create the illusion of depth. When light is cast upon the artwork shadows appear as they would if it were a real streetscape. This Piece was constructed using 6.5mm Wisa Birch Ply. The Frame is made from Wisa birch Formply. This is predominantly used for concrete formwork, however, this particular product is mostly used for feature and furniture construction. This wood is made using sustainably farmed Northern European Birch through the AFS / PEFC certification programs. Certification assures that forests are sustainably managed in ways that are economically viable, ecologically sound and socially just. Leaf Handcrafted Furniture grew as a sideline project from Leaf Building and Design. As more and more furniture orders started coming in Lars made the full shift to just furniture making. With a 17 year background in detailed architectural carpentry and a love of furniture and furniture design, the shift was a natural progression. Leaf Handcrafted prides itself on sustainable living and furniture making using sustainably sourced and accredited materials as well as recycled timber. They enjoy making creative pieces often inspired either by materials, environments or even the clients that the piece is made for! They are always striving to create with a high standard and the hope that each piece will be kept for a lifetime and beyond. View Lars' Handkrafted Profile here. Erin has studied creative arts for many years, including courses in Ceramics and Gold and Silversmithing. In 2003 Erin traveled to Florence, Italy, where she had private lessons with a professional Art Restorer in Old Masters' oil painting techniques. Erin has participated in two group exhibitions. The first, a painting exhibition in Brisbane in 1999. The second, a ceramics exhibition in Melbourne in 2008. Currently, Erin is working towards an exhibition in Queensland of a series of paintings and illustrations which feature an urban theme. View Erin's Bluethumb Profile here. Arts Project Australia exists to nurture and promote artists with an intellectual disability as they develop their art practice. In the early 1970s , the art of people with an intellectual disability was largely unseen or undervalued by society. Myra Hilgendorf OAM, who founded Arts Project Australia in 1974, insisted their artwork be presented in a professional manner and that artists were accorded the same dignity and respect as their non-disabled peers. Myra and her colleagues took a major step in bringing the work to the attention of the art world and general public. 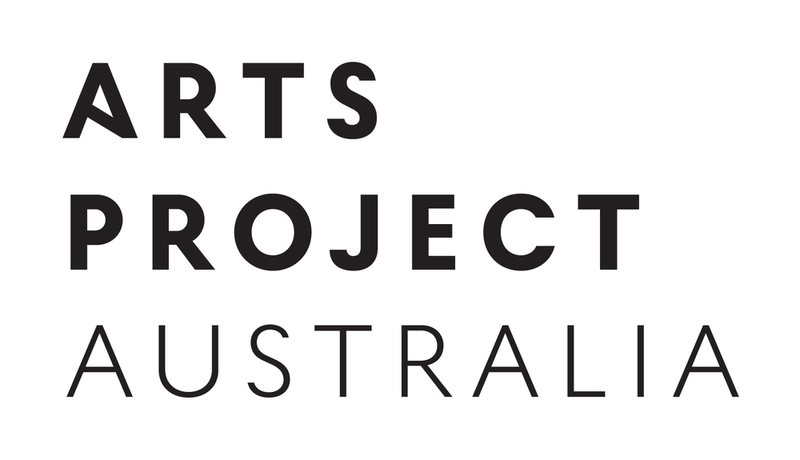 View the Arts Project Australia website here.